Do your prospects believe what you say? One of the biggest challenges for marketers is getting people to believe in your message. Believability is often overlooked in a lot of marketing campaigns. You might have the biggest worst product/service but unless they know who you are most people won’t believe you what they read online. In order to overcome this, there is a neat psychological trick you can use that will make your message sound more credible. It’s by claiming 2nd tier status vs. first tier status. Claiming you are the second best vs. first. Are you a hype man? Constantly hyping your product to be the biggest, baddest, out there? It might work for some brands but online, most people won’t believe your claims. People are especially skeptical online. This is getting harder to overcome as people have been getting bombarded with marketing claims over the last few decades online. Your marketing message has to overcome this skepticism. People won’t you believe unless you back up the claim. And, a great way to overcome this skepticism is by claiming you are 2nd best. I learned this strategy from Ryan Levesque in one of his events. If you claim that you are the second best people will tend to believe you more than by claiming you are the best. 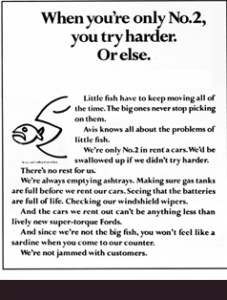 One of the most famous examples of this strategy was the Hertz vs. Avis rivalry in the 1960s. Until the 1960s, Hertz had dominated it’s rival Avis with a market share of 61-29. By powerfully claiming its weakness, Avis positioned itself as the scrappy underdog. People love underdogs. They will root for you. Most do prefer buying from the best, but they’d rather buy from someone they trust. If you keep claiming you are the best at something a lot of people will just tune you out. Belief comes from our own personal experience and our trust in what the other person is saying. If people have been burned before they’ll likely be more skeptical of your claims. People are now more sophisticated than ever. So, they’ve probably heard what you have said before. Combine that with negative experiences and you’ll have people that are especially skeptical. Trust comes from when people believe you are qualified to solve their problem and they believe you can solve their problems. Credibility can come from Testimonials, case studies, and references. Being specific. For example, I made 18,000 in one week vs. I made 18,345.08 in 7 days. The latter is more believable. My virtual mentor Todd Brown always states that for every claim you make you must provide proof. Then highlight the proof with the benefits. You can prove your claims with relevant testimonials, case studies, and pictures. These three things will serve you making your claims believable. Once upon a time, you could get away with making marketing claims but now this has lost its effectiveness. People will no longer believe your claims. You have to back it up. This is the holy trinity of persuasion. The end goal of any advertising campaign is to get people to buy your stuff. In order for people to buy, they have to first believe your claims. And, in order for them to believe your claims you have to back up your claims. A persuasive marketing message is built with emotion and logic. Your copy should elicit the emotional benefits and offer proof of the benefits. Like Todd Brown says, you must think like a trial lawyer. You should provide an emotional and airtight case to your prospect in order for them to buy. Part of being believable is downplaying your claims and cutting back on the hyperbole. To sum it up, being 2nd can be used to your advantage. It will make your claims more believable. Even though people like buying from the best they would prefer buying from someone they trust. Claiming you are 2nd best is a great way to build trust. One of the biggest and most overlooked challenges marketing online is believability. Your message can be clear and concise but lack believability. When you claim you are the second best people won’t question it as much. Just keep in mind that for every claim you make you have to provide proof. My name is Mauricio and I'm the founder The Cardenal Group. I write about online marketing, sales, and entrepreneurship.